Flood season is upon us Vernonia. And as such, it’s time for a friendly reminder to be prepared from the City of Vernonia Floodplain Management. I know many of you recall one or more of the three major floods we’ve experienced over the last 32 years, but Vernonia also has gained a lot of new residents in the last few years, so I’ll start with a brief history. In February of 1996, Vernonia experienced the “flood to end all floods”. It was considered at the time to be a once in several generations event. 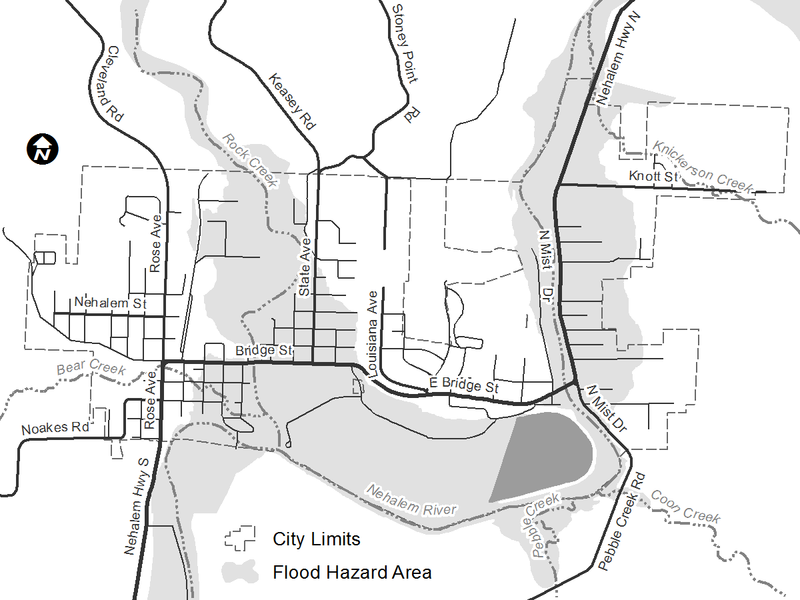 But just under 12 years later, in December 2007, Vernonia experienced an even larger flood, causing extensive damage to hundreds of homes and businesses. In one of those rare instances we actually get the government we pay for, the State of Oregon and FEMA decided to invest tens of millions of dollars in flood recovery and mitigation to reduce flood risk for the community, as well as reduce the long term financial risk to federal and state agencies. All but a handful of effected homes were elevated. Substantially damaged properties were bought out and demolished. The school, health center, West Oregon Electric and our primary electric substation were moved out of the floodplain. The City’s sewer lagoons where upgraded to avoid flood damage. Local authorities established better emergency preparedness and response. The City adopted, and enforces a robust Flood Hazard Reduction Ordinance. And it worked. In November of 2015, Vernonia experienced yet another major flood, however flood mitigation and community preparedness resulted in less than ten structures being flooded, and with minimal damage and loss relative to previous floods. Let’s keep it up and be ready for the next one. Be flood aware. Vernonia has flooded and will flood again. Reminding family and friends, or letting your new neighbor know about flooding in Vernonia, is an easy way to be prepared as a community. Know how high the water reached in 2007, Vernonia’s highest flood of record. If you don’t know how high the water reached in 2007, you can calculate it by looking at the Elevation Certificate for your home. The key information on an Elevation Certificate is the elevation of adjacent grade, base flood elevation and flood of record elevation. Subtracting adjacent grade from the flood of record will give you the height of water in 2007. Subtracting adjacent grade from the base flood elevation will give you the 1% probability of water inundation depth in any given flood season. This was historically referred to as a 100 Year Flood, but that nomenclature no longer used as it helped perpetuate the idea a flood of such magnitude occurs every 100 years more or less. Protect your life. Take flood advisories and warnings seriously. Sign up for emergency phone alerts with the Columbia 911 Alert Network at www.columbia911.com. Don’t enter flood waters on foot, in a vehicle or boat. Floodwaters move and rise quickly and erratically. Floodwaters can be polluted with biological and chemical contaminants. Minimize contact with floodwaters and sediments left after a flood. Protect your personal property. Do not store items below the 2007 flood level at your location. It’s easy to utilize the floors of crawlspaces, garages, shops and sheds outside of flood season. Crawlspaces and garages under elevated homes are there for a reason and it isn’t for storage. Install high shelving or better yet, don’t store items under your home. Items found in shops and sheds, such as power tools, gas powered equipment, or anything which could be damaged by water, should be stored as high as possible. Lawn furniture and other outdoor items which aren’t subject to water damage and easily washed off can be stored under homes to prevent them from being washed away. The contents portion of your flood insurance policy does not cover items which are stored below the first habitable floor of an elevated home or a new home built to our current flood regulations. So as a rule of thumb, don’t store any item, which you can’t bear to lose, lower than first habitable floor of your home. Unfortunately, a few Vernonia residents who were unaware or not prepared for flooding learned this the hard way in 2015, when crawlspaces and garages where used to store a large portion of their personal property. Protect the environment. It is illegal to store petroleum products, paints, pesticides, herbicides, or any other toxic material below the 2007 flood level on a residential property with City Limits between October 15th and March 15th. Just like personal property above, get those products moved up. Protect your business. Most business owners in the floodplain have endured a flood in the past, and fully understand being prepared to take action when a flood is eminent. Have an action plan, and take the time to review it with your employees this year and every year. Be prepared. This goes for the whole community and not just those in the floodplain. Have emergency food and water, as well as general emergency supplies. Power loss and the City’s inability to produce water and/or water restrictions should be expected during and right after a flood. Vernonia can also be isolated due to bridges and roads on either side of town being washed out, and most of the retail stores are subject to flooding and being closed. I’m going to wrap up with a personal flood story, and my best bit of flood preparedness advice. I lost a vehicle to 2007 flood. I wasn’t informed or prepared. I told myself the water wasn’t going to get much higher and by the time I realized what was happening it was too late. That decision haunts me to this day. If you live in the floodplain, have a plan to move vehicles, boats and campers to higher ground. Move vehicles to higher ground as soon as there is even a chance of flooding. Make sure family or friends have access to keys, know where to move vehicles to, and remind them when you’re leaving town. Its regret you can easily avoid.